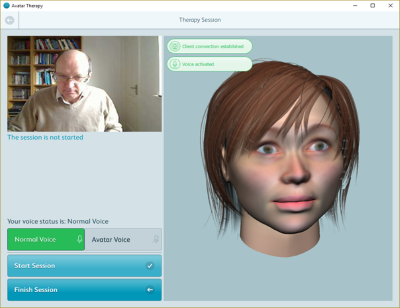 The UCL Avatar Therapy system comprises software for the delivery of Avatar Therapy by trained clinicians within a clinical environment. Two computer systems are required to run the Avatar Therapy system - one for the Clinician console and one for the Patient console. Two modern Windows laptops connected by a dedicated wired or wireless network connection are likely to be satisfactory. PC System running Windows 7 or later. CPU Speed better than 2.5GHz. Disk capacity better than 100Gb (1Gb for avatar therapy system). Display better than 1280x1024 pixels. Graphics hardware supporting hardware accelerated 3D graphics. Internet connectivity for download of software (optional, recommended). Network connectivity for therapy session (wired connection recommended). Good quality audio input for microphone and audio output for headphones, or USB connections for USB audio hardware. Webcam for Patient console only. Headset (headphones+boom microphone) for clinician. Speakers and table microphone for patient. This is a free, fixed term licence which allows clinicians to evaluate the UCL AT software for a short period of time. Limited technical support is available. It is not intended that this licence be used for actual treatment of patients. This licence allows clinicians to run a clinical trial of Avatar Therapy with patients. It is essential that the trial is covered by local ethical agreements. For trials, we do not charge for the use of the software, but we do make a mandatory charge for technical support. Typically technical support is provided under the terms of a Service Agreement that specifies the level of service supplied, and covers installation, training in the software, software updates and bug fixes. In the near future we hope to obtain certification for the UCL AT system as a medical device. This will allow the system to be licensed on a subscription basis, inclusive of software updates and technical support. This licence will allow general use of the software for treatment of patients.